OVERVIEW: A short document titled- Next Generation Science Standards District Implementation Indicators was recently released on the Nextgenscience.org site. This document was built with multiple partners around the US and includes thoughtful recommendations using 13 Indicators of Success. PURPOSE: This document provides school district leaders with guidance for moving beyond an implementation process that might only include a materials adoption and a quick alignment document. The 13 indicators can be used for making the case about how to thoughtfully and intentionally implement the NGSS over a given length of time. AUDIENCE: District administrators, PD providers, teacher leaders, state science supervisors, etc. 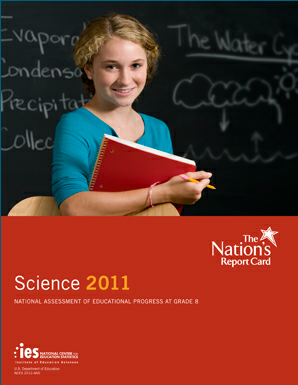 The Institute of Education Sciences (IES) recently released the 8th grade science results from the National Assessment of Educational Progress (NAEP) for 2011. You can download the PDF of the 23 page report HERE. The results show a slight increase in scores (since 2009) in most areas. The Bayer Corporation recently released a new report- STEM Education, Science Literacy and the Innovation Workforce in America. 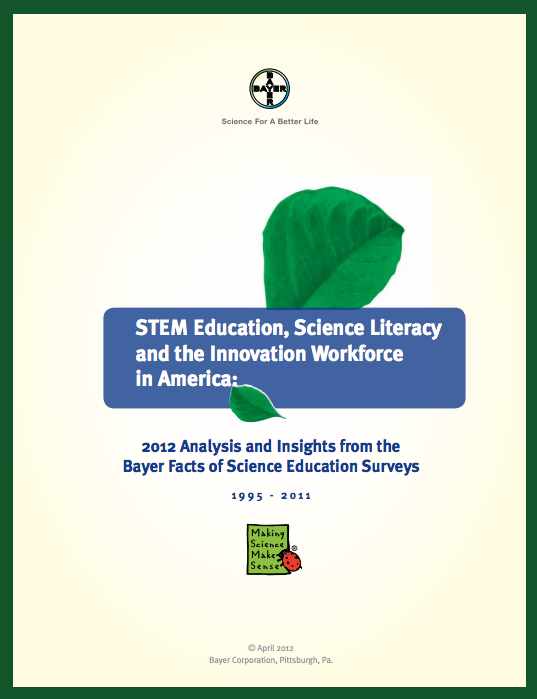 This report provides analysis and insights from the Bayer Facts Science Education Surveys conducted from 1995-2011. This is an impressive report and one of my favorite parts is the list of 15 Universal Beliefs held by the stakeholders polled. See the inset image of those beliefs below. This list could be a foundational piece for making the case about the importance of STEM education in elementary and STEM education as a social justice issue. #1: Science literacy is critical for all Americans young and old, scientist or non-scientist. #2: U.S. global economic leadership and competitiveness are intrinsically linked to a robust science and technology innovation pipeline and workforce. Indians (underrepresented minorities) in STEM fields. #4: Improving science education for all students – especially girls and underrepresented minorities (URMs) – should be a national priority and begin at the earliest possible elementary school level since that’s where the STEM workforce truly begins. #5: Science interest and ability are color-blind and gender-neutral: from an early age, boys and girls of all races and ethnic backgrounds are interested in science. #6: Parents and teachers are critically important to nurturing children’s science interest, even if they themselves are not scientists or don’t have all the answers. #7: In elementary school, science should be the “4th R” and given the same emphasis as reading, writing and mathematics. #8: A hands-on, minds-on approach to science education is the best way for students to learn science and build crucial science literacy skills, such as critical thinking, problem solving and the ability to work in teams. #9: The nation’s colleges and universities should revitalize pre-service teacher education in science. #10: The nation’s in-service teachers should be given the tools and ongoing professional development required to be the best science teachers they can be. #11: Students and teachers benefit from having direct access to scientists and engineers on a regular basis in the classroom. #12: America’s leading research colleges and universities should rethink how they define academic success when it comes to undergraduate STEM students. #13: For corporate America, STEM workforce diversity benefits the corporate bottom line by bringing a range of thought, skills and problem solving to the table. #14: America’s STEM industries and communities need to more effectively communicate with all of today’s students about a range of issues including job opportunities and the fact that they are wanted and needed in these jobs. #15: It will take a village to improve science education in this country and all stakeholders have a responsibility and a role to play. My personal favorites on this list are: 1, 3, 4, 5, 7, 8, 9 and 10. We must be relentless in our focus on elementary science, science as a social justice/equity issue, and excellent science programs for our pre-service and in-service science teachers. How do you plan to use this report in your context? 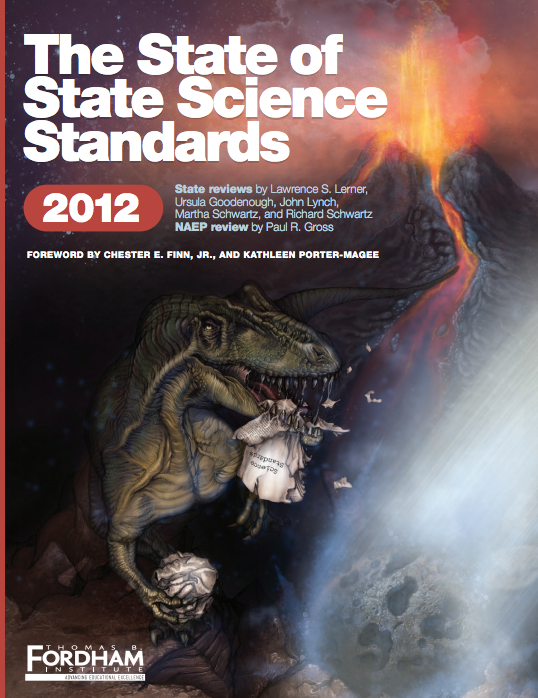 If you have taken the time to read the entire Framework for K-12 Science Education.. then you should be congratulated. However, there are probably many science education stakeholders who would like a Cliff Notes version or a process for digging into the massive document. Luckily, the brilliant and talented Kim Klinke at the Center for Inquiry Science has created a set of tools that are EXCELLENT for making sense of the document. These tools would be perfect for a session of professional development, working with science education stakeholders, or even for your own independent study of the Framework. – You will probably want a copy of the framework document as well.